GOD SPEAKS MY LANGUAGE, CAN YOU? Based on over one hundred interviews with people across all faith traditions, this is, above all, a book of stories, each fascinating and unique. We are invited to read with the express intention of feeling what we have in common with the people whose life stories we find here, whether they are conservative Christian housewives or liberal young Muslim immigrants, Buddhist musicians, or Harley-riding shamans. What does the world look like, sound like, taste like, feel like from that person’s point of view? How have they experienced life’s formidable mystery? When? Where? What language is their true language of faith? What theology has their life given birth to? What pain and what generosity does their faith story need to contain? WHAT READERS ARE SAYING. 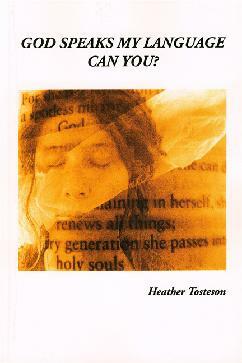 . .
"This is a marvelous read for all interested in the spiritual journeys of others as well as their own. Over 100 interviews with diverse persons from various faith traditions are woven into a narrative that will deepen the reader's own faith as it broadens their understanding of the faith of others." "Heather Tosteson knows how to listen past the surface where differences are so evident to the depths where common hopes and dreams are found. What's more--and this is rare--she knows how to describe what she has heard. This book is a model for genuine and generous conversation." "This is a compelling read whether you are pondering themes, theology, or just being human. I didn't read it analytically, I read it in relationship. I feel like I know these people after reading those very personal interviews. They become part of the tapestry of MY life, MY faith journey, MY spiritual stretching and shifting. Oh - I forgot to mention - the artwork in the book is AWESOME." "I find God Speaks My Language, Can You? very enlightening. It has caused me to be more open-minded. I'm now questioning myself as to how I listen when people share: How accepting am I really of others faith journeys? How willing am I to connect with them and to honor their choices? We all want to think we're tolerant, but are we just hearing what we want to hear? In these stories, we have more details than we might have in a daily conversation, so we can see more things in a person's experience—their childhood and their feelings—that have influenced their beliefs. Our questions become more complicated too—of them and of ourselves." "God Speaks My Language: Can You? is a valuable and fascinating collection of almost one hundred stories of faith, all from the Southeast, reconstructed from interviews by Heather Tosteson, Founder of Universal Table. Tosteson is an astute observer, a courageous and empathetic interviewer, and a splendid writer. She offers her own interpretation of these varied accounts, constructing a plausible typology and suggesting that beneath our commitments to disparate practices and doctrines are personal stories offering glimpses of common religious experiences. This fine book is an invitation to join the conversation about affirming difference in an ever increasing religious pluralism." "While I was reading God Speaks My Language, Can You? I was pulled forward with delight. The book is nuanced, rich, respectful, and musing. Since listening is such a key thing for spiritual directors, the discussion on holding in imagination enriched my awareness of my own process of listening." Spiritual directors or a spiritual direction program might use these stories in role plays as “what ifs”: What if the person whom you are companioning brings such an experience to direction? How might you enter into the world of such a person? This would be a valuable resource for any religious leader who wonders what might be going on in the lives of their faith community below the surface or what led the child raised in the community to leave it and seek another. The book might be used as a supplementary text for a course in religion and communication, where there would be ample opportunity for students to gain a fuller understanding of people who may believe differently than they do, to see points of commonality and also gain respect for profound difference."